Enjoy a Mallorcan-style tapas evening on this 2.5-hour experience in Palma. 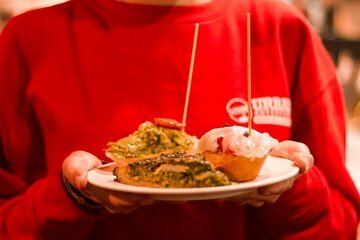 Inspired by the local ‘Ruta Martiana’ tradition of a free drink served with every tapas order, this tour takes you to several bars to enjoy this evening ritual, with five tapas or 'pinchos' (tiny open sandwiches) and five drinks included. Savor delights like tortilla and grilled lamb with wine, beer, or soda, and get insider tips on Palma’s tapas and bars on route. Meet your guide in central Palma, and set off into the handsome streets. On route, hear about the city’s ‘Ruta Martiana,’ a tradition that arose after Spain’s 2008 financial crisis. Faced with cash-strapped customers, several bars in Palma’s old center initiated this business-boosting concept — every Tuesday (‘martes’ in Spanish) evening, customers ordering a tapas would receive a complimentary drink. The idea quickly took off, and this tour lets you experience it like a local, on Tuesday evenings and other nights. Stroll from quaint bar to quaint bar, and stop at each to enjoy a delectable tapas dish or pincho, teamed with a Spanish wine, chilled beer, or soda. Each bar has its own speciality, so expect treats like Mallorca’s biggest tortilla, Spanish jamón (ham), grilled lamb ribs, and fish-topped pinchos. Five tapas dishes or pinchos, plus five drinks are included. Ask your guide for recommendations if you can’t choose, and if you’re still peckish, order more (own expense). The bars hit different notes, too: expect to cozy up in indoor nooks or relax on outdoor terraces overlooking plazas, churches, or hidden lanes. After about 2.5 hours, your tour ends in Palma’s Plaza Mayor. In Spain, the legal drinking age is 18 years. Travellers under 12 years of age are not permitted to join this tour. Our tapas tour with Izaskun was just what I was hoping for. She provided a wealth of knowledge on Palma and it's nightlife scene. She was very friendly and introduced us to the local culture of tapas and local drinks. I would highly recommend this tour for anyone who likes to visit new restaurants and try many different things. It was the people that made the tour! We got to see some great bars we would never had found by ourselves however i think the cost exceeded the value. We go 4 slides of baguette bread with some topping and some pptatoes for the tapas. So make sure you eat before you go. Damia our tour guide was very friendly and obliging so no complaints on the places he chose. This tour is a must do! Also I recommend doing this at the beginning of your stay so that you can come back and visit the yummy places afterward. Marialara and her husband are absolutely wonderful people! They go out of their way to make you feel welcome, and make sure you have a great time. Also, no shortage of food in this tour! What a great evening! Damià was the perfect tor guide to navigate us through the streets of Palma. He chose a variety of tapas bars, and made a food and drink recommendation for each. He was able to accommodate the vegetarian in our group with ease, and answered the many questions we had about the sights and culture of Mallorca. That evening we received a lengthy email follow up with details and directions to sites and places we had asked about, including beaches, bakeries and restaurants. His knowledge and love of his island and culture made the tour one that we would do again in a heartbeat. This was the BEST!!! What a great evening. So glad we found it. Talk about a real tour!! Our guide Andrea was fun and knowledgeable and gave an insider view of fun taps bars which we never would have found off the tourist track. There were 6 in our group and we made 4 new friends from the UK and Australia which added to the fun. We really got to see the life of beautiful Palma. Afterward, Andrea made certain we were able to get safely back to our cruise on time as we were cutting it pretty darn close. We were having so much fun the tour lasted longer than we thought. This sort of tour makes for a memorable vacation. Just do it! Fabulous host. Great venues. A wonderful evening. BEST FOOD TOUR EVER! We've done several food tours in Spain and France - from the variety and quality of the food and drinks to the relaxed pace of the evening and knowledge and hospitality of our guide - this one tops them all! If you love trying new foods and meeting new people - this tour is for you. We loved spending time conversing with the other six people in our group from various countries and had a wonderful night! Our tour guide, Damia, was terrific - very friendly and engaging and the selection of tapas and pinchos was perfection. We would recommend this tour to anyone visiting Mallorca looking for great food and great company. As promised, Damia emailed us the next day with the names and addresses of the restaurants on our tour and tips and information regarding other local activities. If we visit Mallorca again we will definitely book another of Damia's Urban Adventures Hiking Trip or Paella Cooking Class. What an amazing night, Marialaura was our guide, she was very friendly and knowledgeable. The 5 stops on the tour were perfect, we were meet by friendly bar staff who were really helpful. The food was very tasty and there was lots of choice with Marialaura's expertise on hand to help with our choices when we couldn't decide. Photos were taken during the tour and emailed to us the next day along with a list of places we had visited and our food choices. The bonus with the tour was the drink included with each stop. For a fun evening and the confidence to order tapas, book this tour, its value for money and a wonderful experience. A big, huge thank you to Marialaura, you were the perfect host. What a fantastic evening we had - we were 7 female friends led on the tour by the fantastic Damia, he was an excellent guide / host. We visited an area of Palma that we would probably never have found and the 5 Tapas bars we went to made us feel welcome and greeted us with fine food and wines. Although the tour was for 2 1/2 hours we were most definitely not rushed and there was no urgency to finish in this time. Myself and my 6 friends had the most enjoyable evening and we thoroughly recommend this experience.